Young Adult or Elementary School? 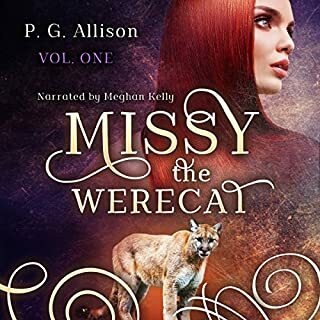 Would you try another book from P. G. Allison and/or Meghan Kelly? The author? Maybe. The narrator? I really don't think so. What was most disappointing about P. G. Allison’s story? I'm halfway through this book, and I'm not sure I can finish it, which is extremely rare for me. I generally don't write reviews and try not to be critical of authors, but I'm honestly horribly disappointed that I purchased this book based on the star counts that it has.The story was written with hugely broad generalization of story lines and extremely contrived and unrealistic dialogue. The story felt like an elementary school book written for small children with storybook like occurrences such as Missy telling a young child she saves to call her if she ever needed to talk and how everyone in the room could see they were now bonded like sisters. Someone in an earlier review mentioned how this book seems more like a summary of a plotline for a book and you keep waiting for the story to start, this is EXACTLY my sentiment. Another way to look at it is that it reads like a Disney story telling you how everything happened with no descriptive language about the events. Missy ran away to the mountains, she was attacked by a bear, she got shot by a hunter (this is all in chapter one or two not really a spoiler) nothing describes any of these events, you are just told they happened. At first you think "OK so back story explaining how she came to be" but No! It never stops. The whole first half of the book so far is written like that.The dialogue?? Just, wow. Conversations between FBI agents and doctors, or doctors and nurses that would never happen filled with language they would never use and completely contrived to summarize a story line. This is one of the biggest negatives of this book to me. I could live with the summarizing of events if, when she did she decide to go into detail, the author made it realistic, but she doesn't. When reading story elements, the narrator is great, I enjoy her reading. However, I would prefer she continued to use her natural voice rather than attempt to give the characters voices as the voices she creates are, sadly, awful. The women all sound like 40 year old blueblood snobs (or as someone else said, Nannies) and then men are just... I can't even decide. Listening to her voice dialogue is painful, and when combined with the extremely contrived dialogue the story suffers from in the first place, makes for a bad listening experience. None that I've come across so far. As I said, I don't normally write reviews. If I don't enjoy a book I simply don't buy books from that author anymore. I have 210 books in my library purchased since 2011 and this is the first time I've felt compelled to write a review.